Jane Eyre was an orphan, who was brought up first by an unloving aunt, Mrs. Reed, and later at an institution for poor orphans, Lowood, before being employed as governess at Thornfield Hall. 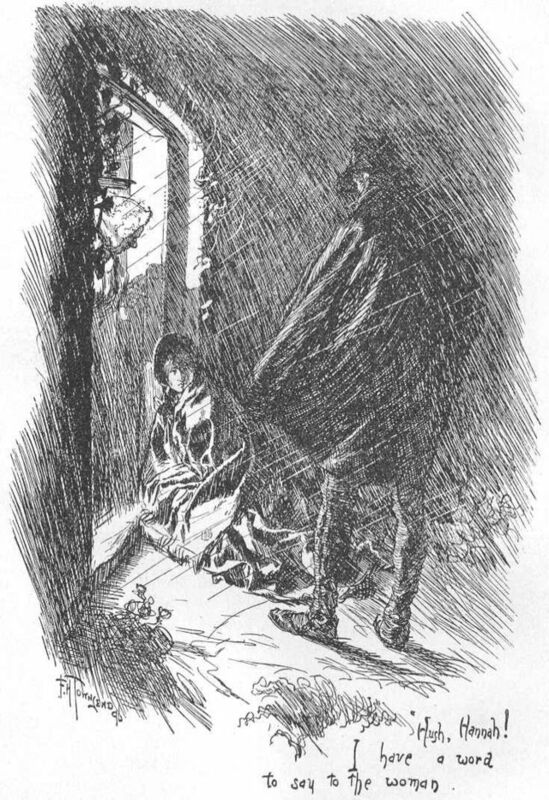 Although Jane suffered hardships and humiliations, and found very little compassion at that time, her life was not in danger due to unbearable social circumstances until she made the decision to leave Thornfield Hall and venture into the world practically penniless, without any friends or family to turn to. At that point in the novel, Jane Eyre’s life was in serious danger. Her life was saved thanks to the compassion and generosity of the Rivers family. When Jane Eyre left Thornfield Hall at dawn, after discovering that Mr. Rochester was already married to Bertha Mason, she took only some bread and twenty shillings, which she spent on travelling as far away from Mr. Rochester as she could. Jane’s life was seriously in danger, with no possibility of claiming the social benefits we are accustomed to today. In my previous post, I have already discussed some of the social injustices which were commonplace in the 19th century. St. John Rivers admits Jane to Moor House, by F. H. Townsend, 1868-1920. ‘My strength is quite failing me,’ I said in a soliloquy. ‘I feel I cannot go much farther. Shall I be an outcast again this night? While the rain descends so, must I lay my head on the cold, drenched ground? I fear I cannot do otherwise: for who will receive me? But it will be very dreadful, with this feeling of hunger, faintness, chill, and this sense of desolation—this total prostration of hope. In all likelihood, though, I should die before morning. I contrived to mount a staircase; my dripping clothes were removed; soon a warm, dry bed received me. I thanked God—experienced amidst unutterable exhaustion a glow of grateful joy—and slept. Jane admits that if it had not been for them, she would have probably died. However, the Rivers had problems of their own. Shortly after this event, the three Rivers are forced to shut up and abandon Moor House, where they had lived all their lives, because their financial situation after their father’s death was precarious. St. John took over the parsonage, and Mary and Diana had to leave their home and their town in order to find jobs far away as governesses. Jane is procured a job at the local Parish School. Months later, when Jane is informed, through Mr. Briggs, the solicitor who interrupted the bigamous wedding farce, that she has inherited twenty thousand pounds from her deceased uncle, John Eyre, she shared it in equal parts with the Rivers. She also recovered and renovated Moor House, where the Rivers, who were her discovered to be her cousins, returned to live with her. She received compassion and returned their compassion by sharing her inheritance with them. In the sequel I’ve written, All Hallows at Eyre Hall, Jane has grown into a socially conscious manager of the Rochester Estate, who spends a great deal of her time and money on the education and employment of poor children and orphans. I am convinced that she would have used her privileged financial and social position to help others, especially having experience much hardship herself. Compassion cannot be taught, but it can be learnt from experience, or developed by building awareness. Thank you for this analysis; it takes me back since I haven’t read the original ages. Jane was a tremendously compassionate young woman. It strikes me that, even though she was devastated when she found out that Edward was already married, she didn’t blame him or Bertha for it. She looked at Bertha with compassion and horror for her condition. She also didn’t come to hate Edward for deceiving her. She couldn’t tolerate his behavior, but she understood. Lovely post, Lucy, and so interesting to look at Jane Eyre from this angle. She didn’t blame people for their weaknesses and also showed compassion for herself, believing in her right to be fairly treated, despite her poverty. I like the idea of you turning her into a socially conscious manager of the Rochester estate in your sequel. Thank you, Anne. I need to expand it because there are many more examples of compassion.